I am currently undecided. I am a Baker-Nord Scholar in the Humanities, so it is no coincidence that I intend to major in the humanities. I have developed an interest in the field of Cognitive Science since coming to CWRU, and am considering a major/minor in Theater. Why are you interested in studying these subjects? My mother is a neuro-oncologist, so I’m sure she would be glad to hear her son has an interest in the brain and mind. Theater was not actually a practical interest of mine until my first semester at CWRU, but my involvement in student theater at CWRU has become a source of pride and joy for me. What is your favorite class and/or faculty member, and why? My favorite class so far has been Gesture in Cognition and Communication with Fey Parrill. I was not in the class at the beginning of this semester, but joined in the days before the add/drop deadline and am quite thankful that I did. The papers we read and discuss in class are never dull, and I am absolutely amazed by what I learn every time that I walk into class. It has completely changed how I look at the world as well. I can’t help but notice people’s gestures and wonder how they figure into their mental processes. Taking this class has sparked my interest in a field to which I hadn’t given much thought prior to this semester, and I look forward to taking more classes in Cognitive Science. My favorite faculty member is Chris Bohan, who teaches Acting II. Chris effortlessly connects with students as professionals and as peers. He is down to earth, not afraid to joke around with his students, yet also respects each one as an individual and expects them to always challenge themselves under his guidance. I take something away from every class with Chris, and I am extremely grateful to be learning from him. Why did you choose CWRU? As a student with broad interests who was unsure about their potential major, I was comforted by the fact that I would be free at CWRU to explore the subjects I was interested in without restriction. I was not seriously considering attending CWRU until I visited for a student weekend in April. The time that I spent on campus and in Cleveland that weekend absolutely sold me on becoming a member of this community. The students and faculty I have met at CWRU were genuine people, proud to be living and working here, and many students I spoke with saw CWRU and the opportunities it offers as central parts of their lives. What do you like best about CWRU? I cannot imagine myself going to school anywhere else. There have been times when I have unconsciously called returning to campus ‘coming home.’ CWRU feels like a second home to me. I am comfortable exploring what I may be interested in, sharing in that interest with others who are passionate, and getting the proper guidance I need to set and reach my goals. What do you like best about living in Cleveland? My friends from New Jersey often complain about the lack of good food around the cities or small towns in which they go to school. There are a few foods from New Jersey that Cleveland can’t match (namely bagels and pizza), but then again, Cleveland has Mitchell’s Ice Cream. Mitchell’s Ice Cream is the best part about living in Cleveland. Describe any research projects, study abroad, internship or other unique experiences and opportunities you have had as a result of being a CWRU student. I joined with the Social Justice Institute for a pre-orientation program that was a great introduction to the community of Cleveland. During that time I met with many individuals who have had an impact on their community in areas of race relations, LGBT+ rights, and environmental consciousness. We visited Rid-All, a dumping ground transformed into an urban farm complete with greenhouses and vegetable gardens. I met Anthony Doerr, the author of the university’s common reading book All The Light We Cannot See, who also gave an incredible university convocation. 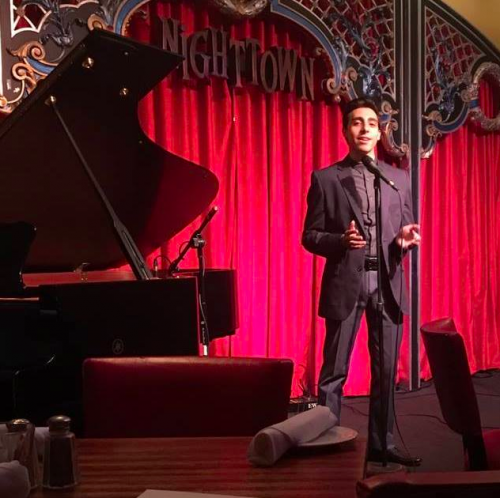 I performed in my first theatrical production last semester with the CWRU Footlighters and have since been a passionate supporter of student theater on campus. I performed in the Players’ Theater Group (PTG) experimental show Neofuturism, which involved putting on 30 two minute long plays within an hour (and will join them in writing scripts and performing for another run this semester). I house managed the theater department’s production of The Illusion in March, and will be assisting with Eldred’s production of Aliens with Extraordinary Skills in April. The Baker-Nord Scholars and myself had a personal dinner with Ohio Senator Sherrod Brown following his Humanities@Work discussion. This month, I will be conducting a research study in how dividing attention affects gesture rate a s part of my cognitive science course. I am a proud member (and as of this semester, Treasurer) of the CWRU Footlighters, Case’s fully student-run musical theater group. 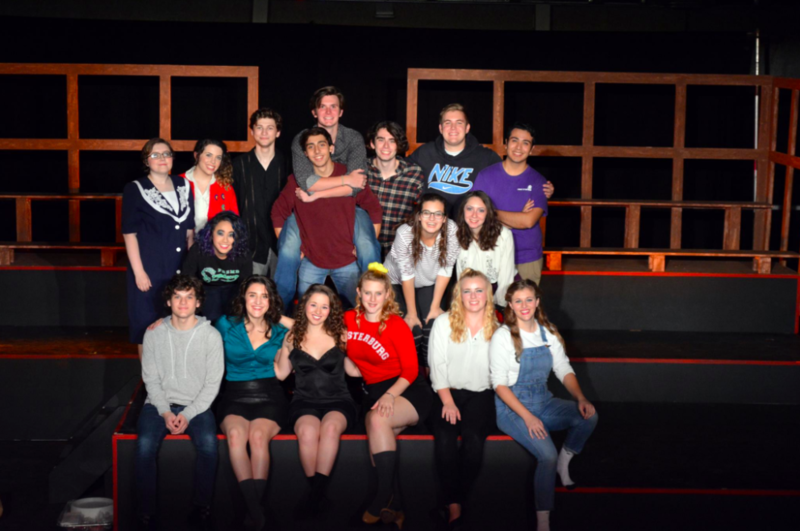 The Footlighters has a special place in my heart, as I had never performed on stage until playing Kurt in the Footlighters production of Heathers: The Musical. I am excitedly returning to the musical stage this semester as the lead role of Emmett in Legally Blonde: The Musical. I am also a programmer at WRUW 91.1 FM, Case Western Reserve University’s independent radio station. I host my own formatted radio show, Free Samples, in which I trace sounds of popular music, hip-hop, and R&B back to the songs used in their production. What are some of your other interests and hobbies? I have visited the Cleveland Museum of Art at least ten times since arriving on campus in August. They have an incredible collection and I am stunned any time someone tells me they have not yet been there. I have a growing vinyl collection that I enjoy listening to at WRUW. I also write song and rap lyrics and use them to make music with my friends when I am home in New Jersey. I am a member of my hometown first aid squad and hope to become a certified EMT over the summer. What do you consider to be your biggest accomplishment so far? Before coming to CWRU I was afraid to take any kind of leadership positions. I normally see myself as a leader by support, someone who is a leader by offering encouragement and listening to people’s concerns. When I was first running and then elected to be the Treasurer for the CWRU Footlighters, I was concerned that I would not be a good enough leader or that there was someone else who could do the job better. Over time I have become more comfortable in the position, even though there is a lot of pressure involved; this semester’s show, Legally Blonde: The Musical, is the biggest production our club has ever put on, and therefore, the most expensive. Seeking alternate funding for the musical with the help of other executive members, I drafted an application for the think[box] Student Project Fund (which grants funding to groups on campus with ambitious projects) to subsidize our massive set. When the application was approved, I felt I had tangible sign that I was making a difference as a leader. I see this is as my biggest accomplishment so far.